Earlier this month, I guest posted on Paranormal Wastelands and Immortality Revolution about the monsters that scare me the most. Here's the post in case you missed it. A doppelgänger is a person's physical double. Seeing one's own doppelgänger often heralds death or serious illness. Paranormal investigators believe that the doppelgänger is an individual's past or future self. In some traditions, the double has no shadow or reflection. There's something undeniably scary about children gone evil wether it's through vampirism (Salem's Lot), radioactivity (The Children Of Ravensback), aliens (Village Of The Damned) or just plain insanity (Devil Times Five, We Need To Talk About Kevin, The Good Son). I like creatures and animals that go bad. Also like the paranormal monsters. Never know what you're going to get. I don't think I've seen a single one of the movies you've highlighted. I've bookmarked so I can re-visit and watch all the trailers. Popped in from the Halloween hop. I love zombie movies, but I've got to admit that evil kids totally creep me out! I can never watch a movie with an evil kid in it or I have nightmares! Great list. I'm having a hell of a time finding a movie I saw when I was little. Maybe you can help. It's about a little boy who pretty much causes accidents to happen. the one scene I remember the best is him sitting in the car in the garage and the door gets stuck, his father goes to fix it and his tie gets caught on the chain and hangs him. any ideas? How fun!!! I love getting into the Halloween spirit. Talk about evil kids, I'm still traumatized from Orphan. That movie creeped me out!! I used to love DOPPELGÄNGER with Drew Barrymore when I was in my teens! I don't think I've seen any of those movies. My big thing in film is silent and early sound films, and there are tons of classic horror films in that era. The monster I chose for the bloghop was M. Bison, who scared me so much as a teen. If I were to play Street Fighter again so many years later, I'm sure I'd still be quaking in my boots when it came time to face off against this evil, psycho creature in the final round. Monsters? I love them all, but I adore zombies. So I'm a zombie lover! Thanks for this post. I found it fun and entertaining. You're right, using kids as monsters really gives me the creeps and I stay away from most all those movies. Kids are supposed to be sweet, not evil, or dead and evil! Great choices, I also enjoy Doppelgangers. In my own works I have used a Fetch which is like a doppelganger ghost. Thanks so much for joining my bloghop, I really appreciate it. 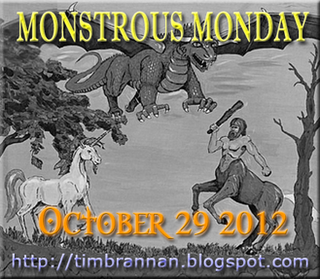 I signed up for Monstrous Monday albeit late. I'll get something up. Thanks! Helloooo Vanessa! I'm stopping by for the Halloween Blog Hop! Hi Vanessa, from central BC. This was some scary stuff. Evil kids are terrible to read about or watch in a movie. Some great movies there. Most are new to me too, so thanks for giving them some time in the light. This month has been amazing for movie recommendations, and it's an interesting experience to watch movies like this for the first time many years later. Oohh! I want to see those doppelgängers movies! I love the doppelganger concept. Very gothic! I have to say that the most frightening scenarios is the evil child - just gives me the willies thinking about them. Maybe this comes from seeing The Bad Seed as a child LOL.